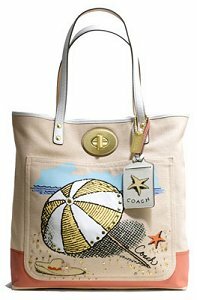 For a beach bag with designer style, look to this umbrella tote from Coach. With its whimsical umbrella illustration by acclaimed French artist Pierre Le-Tan, this pretty tote looks perfect for summer. Its design starts promisingly as well, with Coach's traditional luxury fabrics passed over for a more practical water and stain resistant canvas. But Coach just can't help itself. It dresses up this tote with gold patent leather trim, which while lovely to look at isn't so practical at the beach. The canvas might not mind a few splashes, but the straps certainly will. I'm also disappointed by the dimensions, which seem a bit narrow for easily accommodating a fluffy beach towel along with all the other beach essentials. Of course you could always carry your towel, but that kind of defeats the purpose, doesn’t it? At least the interior is well designed, with a pair of open pouches and a zippered pocket helping to keep those beach bits and pieces in order. At $268 this is a pretty expensive beach bag, but that price isn't altogether unexpected for a designer tote. If you love labels, this sweet collaboration by Coach and Pierre Le-Tan may be worth the splurge. The Coach Pierre Le-Tan Seahorse tote is a professional alternative to this umbrella bag.